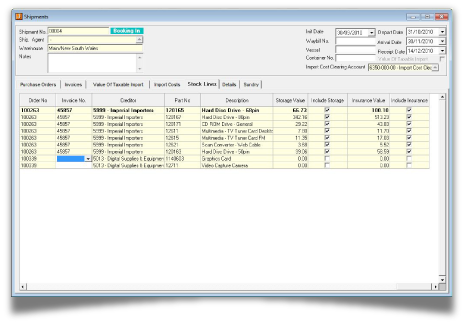 JIWA Landed / Import Cost streamlines the management of goods' shipments and efficiently and accurately calculates the actual costs associated with general purchasing and importing. Value of Taxable Imports - timing differences and exchange rate variations create a value of imported goods upon which GST, duty and charges are calculated, which differs from the valuation that you may use several days or weeks later. This impacts the Value of Taxable Imports (VOTI) and the amount of GST you are deemed to have paid or need to pay at import. JIWA has created a special VOTI workflow to assist in handling these variations. JIWA allows the correct GST and purchase figures to be entered for the Business Activity Statement (BAS) at the time of entering the Landed Cost Shipment.